Mirna Valerio has finished 10 ultramarathons and nine marathons. She is sponsored by a handful of sports companies and wrote her first book this past fall about her journey as a plus-sized athlete. Last month, she was declared one of 2018’s trailblazing “Adventurers of the Year” by National Geographic. And on Monday she’ll run her first-ever Boston Marathon. For her, this is another opportunity she never imagined she’d have. It’s another chance, on a bigger stage, to challenge herself and to help others see what they’re capable of too — no matter what anyone else thinks. Who cares if someone else says she’s slow? Or doesn’t deserve to be there? People have said both things to Valerio. It never occurred to her, though, not to run. “I was just doing my thing and I never cared what other people thought,” she says. In the process of doing her thing, she has garnered thousands of fans who are inspired by the way she is changing the stereotype of what runners have to look like. 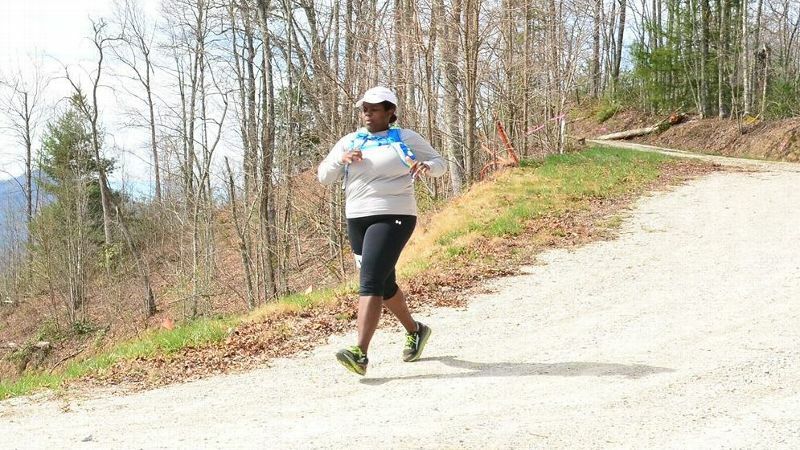 It’s not often you see black women at trail races in Georgia, where she lives and teaches at a boarding school in Rabun Gap. And it’s definitely not often you see black, female, plus-sized runners tackling events like the TransRockies Run, a six-day, 120-mile race through Colorado. Even though she made it through only two stages of the six days, this year she plans to go back and try her hardest again. Because that’s what she wants to do, and she wants you to do your thing too.